I was recently contacted by a descendant of Carrie (Kanistanaux) Horton, through Carrie’s daughter Mary. 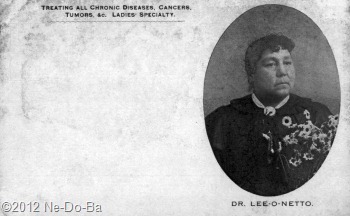 This descendant shared a scan of both sides of a post card with an image of Dr. Lee-o-netto on it. It appears to be a professional calling-card or business card of some sort. I decided to try to learn more about this post card and share what I learned. I found several good online resources that were very helpful. This card is similar to one I found last year at Playle’s Online Auctions. I was unsuccessful in contacting the seller or buyer to get permission to use their image. The image is no longer available online, so you will have to take my word for it. I did make a low-res copy for my research file. I do not know what the back of the Playle’s card looks like or the size of the card. The front is identical to the one above except for the added text “THE INDIAN DOCTRESS.” in a slightly larger font under her name on the Playle’s card. So, already I have learned something new. There is more than one printing of this card. I think this card is a professional calling card or early form of business card. Of course, I could be all wrong. In my opinion it fails as a business or advertising card . It does not tell me how to contact her! As a calling card it works, but it does not follow the “recipe” for a proper calling card. And – why is it printed as a postcard? Was she handing them out to her clients as promotional materials? Perhaps she was using them to contact her clients? Was it for writing her prescriptions or directions and mailing to a distant client? This last one may not be a good guess. Since she made her money by selling her medicines, I think she would be mailing a package to her distant clients and would include directions in the package. Do any of my readers have any suggestions as to how she may have used these cards? I tried to learn more about business cards at the turn of the century but online search results turned up page after page of modern companies eager to sell me historical, vintage, or antique styled business cards. I tried a couple of different search engines with similar results. I just could not get through the commercialism to find meaningful information. If any reader knows of a good resource (online or off) concerning business cards and promotional materials of the late 19th and early 20th century, please take a minute to leave a comment. What else can I learn from this card? 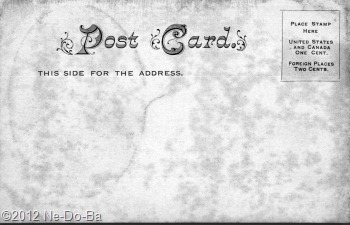 The word “Post Card” and the undivided back tells me it was printed after December 24, 1901 and very likely before March of 1907. It all has to do with Federal Postal regulations and you can learn more about it at the sites above. Of course she could have purchased the cards late in 1906 and if she ordered a large quantity, she may have given them out for years afterward. I do not know if this is a “Real Photo Postcard” (also called RPP). The actual card needs to be examined with a magnifying glass to determine if it is made up of dots or smooth gradients. I don’t own the card, so I can’t examine it myself. Even if it is not a RPP, it is a very early post card and perhaps printed by a outfit also supplying RPPs. If I am lucky the stamp box design might lead me to the name and location of the printing outfit. The stamp box on the above card looks very similar to one I found on a RPP from the Bamford Co., but they were located in England, so probably not providing custom work in America. However, that stamp box was on a card dated to 1905 and therefore consistent with the 1901-1907 date already established. Another stamp box that was similar came from the Rotograph Co., of NY, NY. They produced lots of different types of picture post cards over a very short span of time (1904 to 1911). I could find no evidence they did custom work and I did not see anything from this printer in the online collections that used a type style any where near as ornate as the one on the card above. One interesting item I did find was a salesman’s card with prices. The cost to purchase 1000 RPP post cards using a single photograph was $8.00. You could save fifty cents per thousand by buying more. Lee-o-netto’s card would have cost her more because it was custom work. In the first decade of the 20th century, Dr. Lee-o-netto was in her late 50s and early 60s. The woman in the photo appears younger. It is possible she had a professional photographer do a formal sitting specifically for business literature earlier in her career and she kept reusing the same image over the years. I think it will be very interesting to see if other versions of her professional literature turn up in the future. Perhaps I will never learn more about the card, but it is a wonderful example of the business sense of this woman. This interesting little side-trip has added a bit more to my general understanding of this intriguing woman. The card was printed within the 1st decade of the 20th century. This is a period in her life for which I have learned very little. I have not discovered any news-clippings between the mid 1890s to about 1915 for Dr. Lee-o-netto. I have been wondering if she stopped practicing for a time, was touring an entirely different region, or perhaps traveling abroad. The discovery of this card tells me she was still active during this period, so now I should go back to the newspaper archives and dig harder for additional traces of her. He also offered an interesting suggestion about how Lee-o-netto used the card. Perhaps she used the postcard to inform her regular clients of the exact time and location of her next visit to the area. This seems like a very good possibility. It might also explain why I have not found the typical news ads announcing her visits after the mid 1890s. By the turn of the century, perhaps she had enough regular clients and word of mouth referrals to keep her busy, allowing her to dispense with the newspaper ads in favor of direct communication. Definitely a real possibility – Thanks Randy.